Greely's Ashley Storey at the Maine McDonald's awards banquet Friday at the Cross Insurance Center in Bangor. 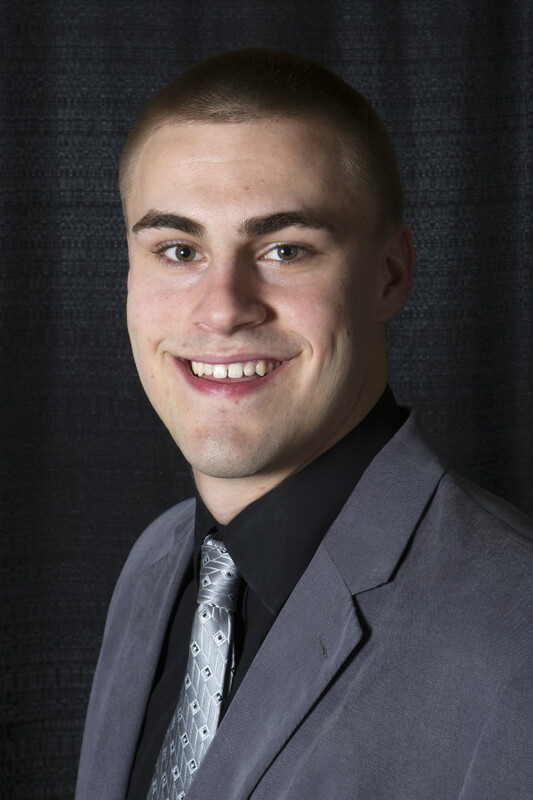 Houston's Kyle Bouchard at the Maine McDonald's awards banquet Friday at the Cross Insurance Center in Bangor. BANGOR, Maine — Kyle Bouchard played basketball with a secret throughout his senior season at Houlton High School — a torn ligament between two fingers of his left hand. What wasn’t a secret was Bouchard’s long-standing candidacy for the state’s top individual basketball award thanks to a shining four-year resume that began adding up the minute he stepped onto the court as a freshman for the Shiretowners in late 2011. 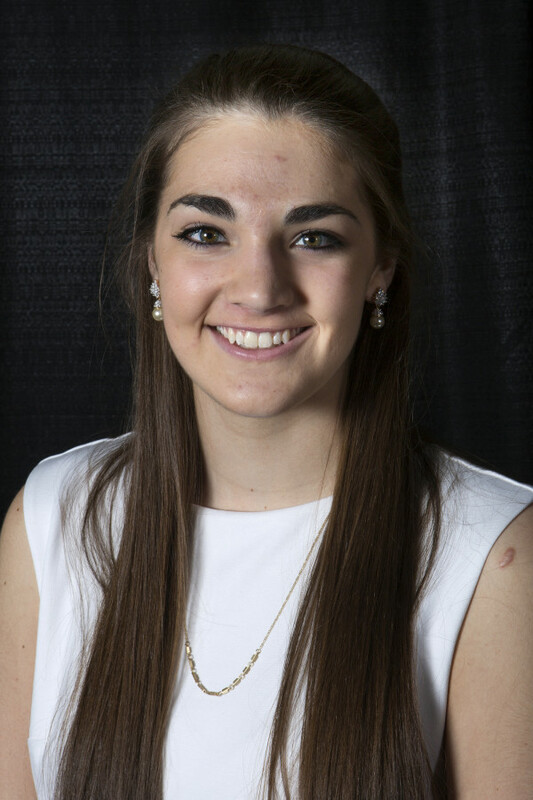 The pursuit of that dream finally was celebrated Friday night as Bouchard and Ashley Storey of Greely High School in Cumberland Center were named the 28th recipients of Maine’s Mr. and Miss Basketball. Those honors capped off the annual Maine McDonald’s High School Senior All-Star Basketball banquet held at the Cross Insurance Center. Bouchard led Houlton to the first of three straight Eastern Maine Class C championship games as a freshman, a run that culminated with the Shiretowners winning the 2014 Class C state crown. This winter Bouchard, a two-time Bangor Daily News All-Maine choice headed for Division II Bentley University next fall on a basketball scholarship, averaged 21.4 points, 10.1 rebounds and 4.2 assists per game as coach Rob Moran’s Shiretowners returned to the regional semifinals. That capped off a remarkable career for the four-year team captain, who amassed 1,815 points, 725 rebounds and 326 assists in 85 career games. “It’s a tremendous honor to be named Mr. Maine Basketball,” said Bouchard, who soon will undergo surgery on his injured hand before turning his attention to preparing for his college career. “I’ve been fortunate to play with some great teammates and for some great coaches over the years, and I couldn’t be more thankful for all the support I’ve received,” he said. Other Mr. Basketball finalists were Nick Mayo, the 6-8 forward from Messalonskee of Oakland, and 6-5 forward Jack Simonds of Falmouth. Storey, a 6-3 center bound for the University of New Hampshire in the fall, edged fellow finalists Hannah Graham of Presque Isle and Victoria Lux of Thornton Academy in Saco for the Miss Basketball Award. Storey capped off her senior season by leading Greely to its first Class B state title since 2004, contributing 13 points and 13 rebounds to the Rangers’ 56-39 victory over Presque Isle in the final. Storey led the Western Maine Conference in scoring (20.0 ppg), rebounds (12.0 rpg) and blocked shots (3.5 bpg), while also contributing four assists and 3.5 steals per outing for coach Joel Rogers’ club this season. Tony Hamlin of Milo, who secured more than 400 victories, three state championships and five regional titles during a high school coaching career that spanned 32 years, was presented the Maine Association of Basketball Coaches’ Bob Brown Contributor Award for his efforts on behalf of the sport in the state. Veteran broadcaster Don Shields of Thomaston was presented the MABC’s Media Award, while Ian Mileikis of Edward Little High School in Auburn and Gabby Scott of Dirigo High School in Dixfield were presented the Spirit of the Game Awards. Since 2009, the annual Spirit of the Game Award has honored two high school seniors who embody the spirit of basketball, exemplify sportsmanship and support and inspire their teammates and coaches. Maine McDonald’s weekend activities continue Saturday at Husson University with four East-West senior all-star games. The A-B boys play at 9:15 a.m., followed by the A-B girls at 10:45, the C-D girls at 1 p.m., and the C-D boys at 2:30 p.m.